Regardless of where you fall on the gun control debate, anything that is decided on and signed into law needs to be constitutional (well, should be at least), otherwise it will be challenged in court and overruled. Congress along with the rest of the country are voicing their opinions, pointing out studies, facts, and figures (We did our own research on gun control effectiveness as a whole here: Common-Sen.se/guns/). Currently, the main piece of legislation on the table is Sen. Feinstein's Assault Weapon Ban of 2013 (read about it here: AWB2013). It attempts to ban, among other things, semi-automatic rifles and shotguns with pistol grips, telescoping or folding stocks, etc, and some semi-auto pistols. At the heart of the bill and the debate on capital hill is the AR-15 rifle. I need to give some unfortunate news to gun-control advocates... AR-15s are protected by the 2nd Amendment according to the Supreme Court as recently as 2008 (D.C. v Heller 1 ). The largest decision that came out of that court case was that the 2nd Amendment not only applies to Militia activities, but applies to the individual as well. The Second Amendment protects an individual's right to possess a firearm unconnected with service in a militia, and to use that arm for traditionally lawful purposes, such as self-defense within the home. They decided that the right of individual firearm possession "applies to weapons used by the militia, i.e., those commonly used for lawful purposes". Sidenote: AR-15s are one of the most common rifles in the US. They come standard with telescoping stocks and 30 round magazines, a combination that is very commonly used lawfully. Ironically, they mention the M-16 rifle, the military version of the AR-15. They also cover the argument that even though people would probably be no match to "bombers and tanks" from foreign or domestic armies...it doesn't matter. To preempt any attack that I may receive: "So you believe people can own tanks and nukes?!". This is Piers Morgan's go-to argument when a guest points out that one reason the 2nd Amendment was created was to protect the people and States from a tyrannical federal government, both foreign and domestic. "The Amendment does not apply to arms that can not be hand carried... it's to keep and bear, so it doesn't apply to cannons. But I suppose there are hand held rocket launchers that can bring down airplanes.... that will need to be decided." 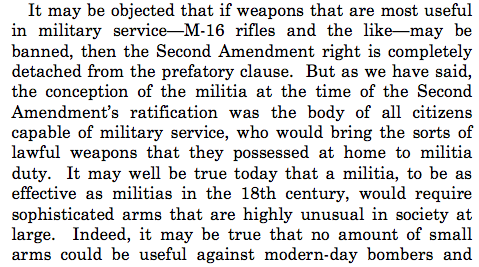 So if owning rocket launchers ever become a problem and they're banned, the Supreme Court will have to decide. Enter your email address to subscribe and receive notifications of news and research by email.